From its origins – ostensibly – as a defensive alliance facing off the Soviet Union in 1949, NATO has seamlessly morphed into an aggressive, globe-straddling operation, whipping recalcitrant states into line in its self-appointed capacity as righter of international wrongs. When the cold war ended 30 years ago, many thought that NATO would be wound up when its raison d’être had disappeared and the Warsaw Pact had been dissolved. But that was to misunderstand the core function of NATO: the advance of US interests, irrespective of who its chief enemy is at any given time. Rather than scaling back its military presence, the US moved to fill the positions vacated by its previous rival. This expansion has been rapid and continuous and has contributed to escalating international tension as Russia sees itself increasingly surrounded by US and NATO bases, including new bases in eastern Europe. The US has pursued this process since the end of the cold war: as the countries of eastern Europe embraced free market economics and multi-party democracy, the US moved rapidly to integrate them into its sphere of influence via NATO. This proved to be an effective strategy, as witnessed by the support of the new member states for the US-led invasion of Iraq in 2003. The 1990s saw NATO developing its regional co-operation forums and inviting new members to join the alliance. In March 1999, Hungary, Poland and the Czech Republic were all admitted as full members. Ten days later they found themselves at war with their neighbour Yugoslavia, as part of NATO’s illegal bombing campaign. That cynical and baseless war brought devastating human consequences to what remained of Yugoslavia – including the legacy of toxic depleted uranium. It was also the first use of Tony Blair’s so-called “humanitarian” war theory – the justification for wars of intervention that were illegal under international law. Developments at that time went in wider directions too. At NATO’s 50th anniversary conference in Washington in April 1999, a new “Strategic Concept” was adopted. This moved beyond NATO’s previous defensive role to include “out of area” – in other words offensive – operations, anywhere on the Eurasian landmass. This fits neatly with Donald Trump’s current orientation to dominate that massive expanse. Subsequently, NATO has pursued a global role – now Colombia is linked to NATO, with Trump mentioning Brazil in this same context. Bizarrely, NATO often falsely postures as a force for humanitarian relief. 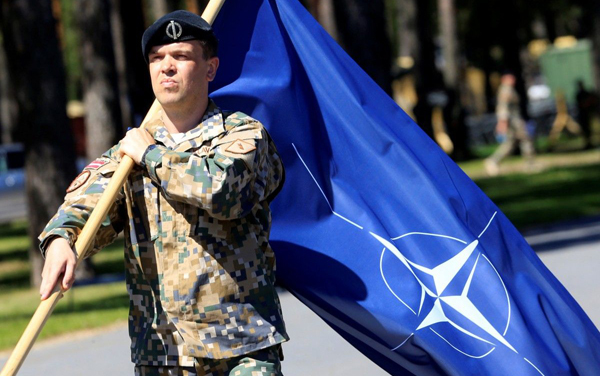 In March 2004, Estonia, Latvia, Lithuania, Slovenia, Slovakia, Bulgaria and Romania were admitted to NATO – not only former Warsaw Pact members, but also former Soviet republics in the case of the Baltic states. In 2009, Albania and Croatia also became members. Montenegro was confirmed as the 29th member in June 2017. Macedonia and Bosnia and Herzegovina are also in negotiations to join the alliance. This scale of expansion has contributed to international tension as Russia sees itself increasingly surrounded by US and NATO bases. NATO’s actions and inflammatory rhetoric continue to escalate tension with Russia: the increasing NATO presence in the region was a major contributory factor to the conflict between Russia and Georgia in 2008 and in the continuing crisis in Ukraine. In addition to opening new bases in eastern Europe, NATO has also opened a training centre in Georgia and will support the reform of Ukraine’s military. NATO exercises are also destabilising. Deployments of troops, including British forces, arrived in Estonia, Lithuania, Latvia and Poland during 2017. Britain has major involvement in NATO exercises which take place on an enormous scale – around 100 in 2017 alone; major exercises have taken place in Scotland and recent B52 exercises over the North Sea were run from British bases. NATO’s war continues in Afghanistan: begun by George W Bush in 2001 – the first step in his “war on terror” – it continues today, the longest war in US history, involving all NATO countries. Despite NATO officially ending its mission in 2014, it has since launched a new “non-combat resolute support” operation, meaning thousands of troops remain in the country. Ostensibly intended to drive out the Taliban and destroy Al-Qaida, the war helped to create and strengthen the conditions for a surge in terrorist organisations and associated fighting forces that continues today. NATO’s “war on terror” has now reached Africa, where Libya has been destroyed; the consequences have been terrible, as thousands have been forced to flee while refugees face ongoing military brutality in the Mediterranean. The international community urgently needs to bring an end to the militarisation of the Mediterranean Sea and to all military action against refugees. These are stationed in five countries across Europe – Belgium, Germany, the Netherlands, Italy and Turkey. There is strong opposition to the siting of these weapons in Europe, including from the governments of some of the “host” nations. Britain’s own nuclear weapons system, Trident, is assigned to NATO. The US continues to press other states to pay for its expansionary policies and wars. At recent NATO summits Trump has insisted that members pay 2 percent of their GDP on military spending, and has even recently raised the spectre of 3 percent. Worldwide, people are in need of real peace, which means social justice, environmental security, equal access to resources, a warm welcome for refugees fleeing wars and oppression and more. The last thing they need is even more military spending. NATO, its expansion, its policies, and its increasing militarisation of societies cannot go unchallenged. They breed war, global injustice and inequality and these are what the peace movement campaigns against. We have marched at NATO summits, with the movements from Europe, the US and beyond, against the nuclear doctrine of NATO, and against its destabilising global power grabs. And we will continue to do so, and to argue for an alternative, whoever is in government, because to condone and embrace NATO is to abandon the cause of peace, the pursuit of justice, and any vision of a world that exists for the people. * Kate Hudson is general secretary of the Campaign for Nuclear Disarmament.